One of the insights I have gained from reading Greene is that we do not see eye to eye when it comes to being fascinated by religion. It is a topic that holds little interest for me. Unfortunately, Monsignor Quixote is very much focused on the “religious”. I’m describing the topic the “religious” because at the heart of the book is a dialogue between Monsignor Quixote, a Spanish priest, and Sancho, who used to be the major of the Monsignor’s home town. Sancho is a communist whose faith in Marx, Engels, and Lenin is as strong as the Monsignor’s in the holy trinity. What Greene sets out to do is to throw both characters together on a journey through Spain in the same manner that Cervantes did with his characters. No question, Greene does create a satirical, well written discourse. However, the topics of conversation and the patterns of conversation get repetitive very quickly – revolving around the wine, purple socks, and for some reason there seems to be a lot of discussion of birth control. Having progressed to about the half-way point, I had my fill of circular discussions and even the odd self-reverential mention of the “whisky priest” (featured in Greene’s The Power and the Glory), and skimmed through the rest of the book. I’m glad I did. I love Greene’s work but not even for him will I sit through something that is not only dull and moving at snail’s pace but also utterly unoriginal. Unoriginal not because Greene is re-imagining the characters and plot of Cervantes’ work but unoriginal because I grew up watching a series of films featuring a Catholic priest called Don Camillo quarrelling with a communist mayor called Peppone – which really is exactly the same plot as Greene’s. 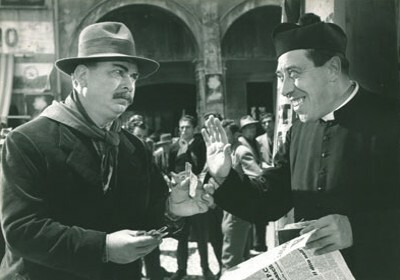 The Don Camillo stories were created by Italian author Giovannino Guareschi (1908–68), and are highly entertaining. Unlike Greene, Guareschi’s characters (at least in the film versions) do not dwell on religious or political theory but focuses on the humanity that both characters, priest and mayor, try to encourage in their respective flocks.